Rajya Sabha proceedings were disrupted Tuesday following protests by the Samajwadi Party and other opposition parties over alleged stopping of SP chief Akhilesh Yadav at Lucknow airport to prevent him from visiting Allahabad. Mr Naidu said he cannot allow them to raise the issue as they have not given notice. SP members said they have received information that party president Akhilesh Yadav was stopped at Chaudhary Charan Singh International Airport in Lucknow by police in a bid to prevent him from visiting Allahabad to attend an oath-taking ceremony of a student leader at Allahabad University. "Please go to your seat. Please don't spoil the atmosphere. This is not the way. We have lost so much of valuable time," Mr Naidu said before adjourning the proceedings till 2pm. Uttar Pradesh Chief Minister Yogi Adityanath had told reporters in Lucknow that the step was taken on the request of the university as there was apprehension that Mr Yadav's visit could trigger violence on the campus. But Yadav claimed the chief minister's statement was "a cover to hide nervousness" and its action showed how "scared" the BJP government is. 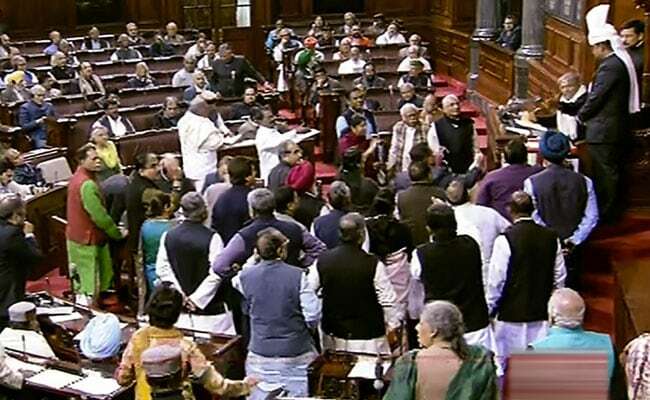 When the Rajya Sabha re-assembled at 2pm, members of SP, Bahujan Samaj Party, Trinamool Congress and Rashtriya Janata Dal (RJD) continued their protests following which the House was adjourned till 2:35pm. As soon as the House met again at 2:35pm, members from various opposition parties trooped into the Well protesting against the incident involving Akhilesh Yadav.